EUPLEX (EUropean Polar stratospheric cloud and Lee-wave EXperiment) is an airborne campaign scheduled to take part from mid-January to mid-February 2003 in Kiruna (Northern Sweden). It is part of the European VINTERSOL programme (see e. g. European Ozone Research Coordination Unit). It will deploy two aircraft, the MM5 Geophysica and the DLR Falcon, which will be used in a coordinated manner. The Geophysica will be equipped with numerous instruments, most of which measuring in-situ. The Falcon will deploy the complete SCIAMACHY validation payload, consisting of the OLEX lidar system, the AMAXDOAS instrument, and ASUR. The objectives of EUPLEX are to critically test current hypotheses for the three key processes of Arctic stratospheric ozone depletion chemistry. ASUR's measurement capabilities allow to provide information on all three processes. PSC formation and properties in Lee-wave and synoptic scale PSCs. ASUR is capable of providing vertical profiles of HNO3, which is a key constituent of PSCs. From the observation of the uptake of HNO3 into a PSC during a PSC underflight conclusions about the composition of a PSC [von König et al., 2002] and possibly its formation and development can be drawn. Measurements of background HNO3 provide a valuable information that can be used as an input parameter for PSC modelling, e. g. modelling of the recently discovered "NAT-rocks" [Fahey et al., 2001, Carslaw et al., 2002]. Further the ASUR HNO3 measurements can be used to determine denitrification [Kleinböhl et al., 2002]. Halogen activation on PSCs. ASUR measures vertical profiles of the halogen compounds HCl and ClO, which play the dominant role for ozone loss in the polar winter. The high horizontal resolution of the ASUR measurements (~15 km for HCl, ~40 km for ClO) makes them suitable for studies dealing with large variations on small horizontal scales, e. g. chlorine activation in the presence of lee-wave induces PSCs, or in close proximity to the vortex edge (see image). ASUR's HCl measuremens will be particularly valuable for EUPLEX as no in-situ measurements of HCl will be performed on board the Geophysica. Chemical ozone loss. ASUR is capable of measuring ozone and N2O in a large altitude range. 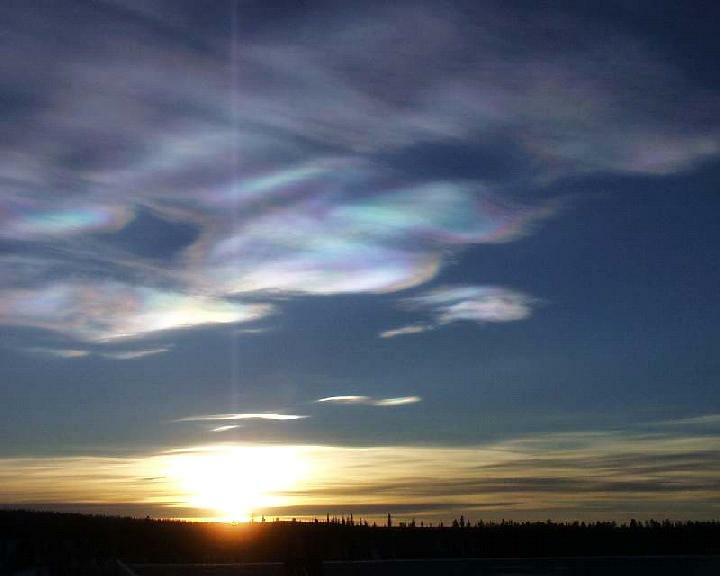 As N2O can be used as a dynamical tracer in the polar stratosphere, the chemical loss of ozone can be seperated from dynamical variations and therefore determined by ASUR measurements. This has been shown during the SOLVE/THESEO-2000 mission in winter 1999/2000 [Bremer et al., 2002]. Within a joint project between ASUR and the Arctic Lidar Observatory for Middle Atmosphere Research (ALOMAR), which is located on Andoya Rocket Range in Norway, overflights of the ground-based ozone lidar at ALOMAR will be performed during the EUPLEX campaign. The ALOMAR ozone lidar is capable of measuring ozone up to an altitude of 60 km with a high altitude resolution. During the overpasses ASUR will perform ozone measurements with its high resolution spectrometer (CTS) that will yield profile information up to 65-70 kmaltitude. Intercomparisons of the lidar measurements with the ozone profiles of ASUR will help to assure the quality and accuracy of these kinds of measurements, with a focus on the upper stratosphere and lower mesosphere, where ozone measurements are sparse. Further mission objectives will be the performance of measurements for satellite validation purposes, e. g. for the MIPAS-instrument on board ENVISAT, the radiometer of the ODIN satellite, and NASA's SAGE III. The latter validation effort will be coordinated with the SOLVE-2 campaign of NASA's DC-8 research aircraft, which will be also operated from Kiruna in January/February 2003. 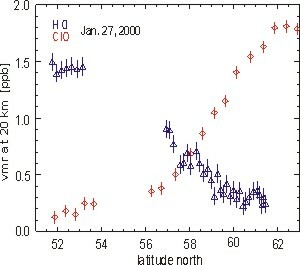 HCl and ClO observed by ASUR during a flight across the edge of the polar vortex in Arctic winter 1999/2000. Fahey, D.W., et al., The detection of large HNO3-containing particles in the winter Arctic stratosphere, Science, 291, 1026-1031, 2001. Carslaw, K. S., et al., A Vortex-Scale Simulation of the Growth and Sedimentation of Large Nitric Acid Particles Observed during SOLVE/THESEO 2000, J. Geophys. Res., in press, 2002. EUPLEX is carried out within a European collaboration that is coordinated by the Institute of Chemistry and Dynamics of the Geosphere, Stratospherere Branch, of the Forschungszentrum Jülich. 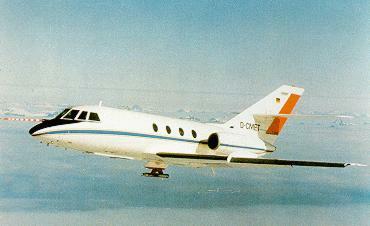 The Falcon research aircraft as well as the OLEX lidar on board the Falcon are operated by DLR. The "stratosphere-mesosphere intercomparison of ozone profiles" is a collaboration between ASUR and the Arctic Lidar Observatory for Middle Atmosphere Research (ALOMAR), Norway, that was made possible by the "Access to Research Infrastructure" (ARI) programme by the European Union. The Falcon aircraft in the Arctic. Polar Stratospheric Clouds observed over Kiruna in January 2000.